Four decades of significant contribution to the benefit of the British Forestry Industry has been recognised by a national charity. During its annual Field Weekend in June, Woodland Heritage was delighted to present Suffolk County Council’s Woodland Advisor, Gary Battell, with its Peter Savill Award, only the eleventh time such an accolade has been given. The criteria for the Peter Savill Award are that the contribution to forestry made by the individual selected annually by the trustees of Woodland Heritage must be in sympathy with the charity’s objectives and in one of five areas of forestry: silviculture, marketing, education, wood processing and research. 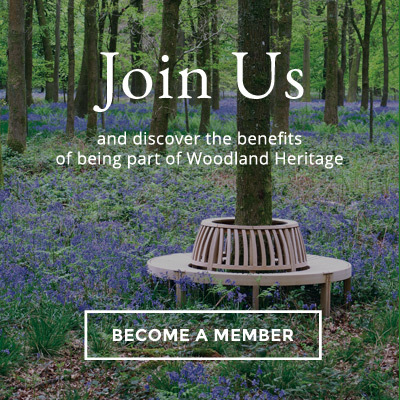 At the Woodland Heritage Trustees’ December meeting then Chairman and Co-Founder, Peter Goodwin’s, nomination was read out: “True passion can engage and inspire action. Gary Battell certainly is passionate about trees, the wildlife they support and the bluebells they shelter. I commend Gary’s nomination for the 2017 Peter Savill Award”. Speaking at the presentation, Managing Trustee and Co-Founder, Lewis Scott said: “In recognition of Gary’s contribution to forestry through the giving of his time selflessly in the cause of tree health, woodland management, woodworking and education, Woodland Heritage Trustees were unanimous in awarding him their prestigious Peter Savill Award and his name is added to a growing list of greats within the industry”. Gary’s love of trees originated in his time as a Boy Scout whilst living in a children’s home for the first fourteen years of his life. He has worked in woodland and park management since 1975 including posts with the Forestry Commission, the National Trust and, since 1998, as Woodland Advisor to Suffolk County Council. He was a founding member of the Ancient Tree Forum, sits on the Regional Committee of the Royal Geographical Society and the Committee of the Royal Forestry Society’s East Anglian Division. His enduring friendship with the late Dr Oliver Rackham brought him additional landscape history and ecology knowledge which he now passes on to a wide audience. He is a valued adviser to numerous organisations as well as helping individuals to get into forestry or set up their own businesses. During such spare time as he has, Gary supports the management of Staverton Park, with its 4,000 magnificent Oaks in an ancient deer park. In the nearby small Woodland Heritage tree nursery he raises acorns to supplement the site with young Oaks. Since his attendance at Forest Research’s inaugural meeting to discuss what Dr Sandra Denman had just named “Acute Oak Decline” (AOD) he has been closely involved in the work at Alice Holt earning huge respect and appreciation. He continues to play a leading practical role in the filming of the AOD research film.